Our mission is to help build a happier, healthier society, and we do this by connecting people with self-care information, real stories and professional support across a range of mental health and wellness topics. Connecting over 1 million people with counsellors and psychotherapists. 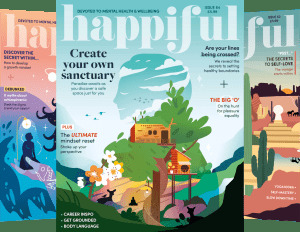 We run a network of directory websites with over 20,000 professional members, and also a produce free digital monthly magazine called 'Happiful'. Our directories include Counselling Directory, Hypnotherapy Directory, Life Coach Directory, Therapy Directory and Nutritionist Resource. We continually engage with professionals from across our websites to help inform our writing and advice, in addition to including the real-life experiences of readers. We are dedicated to signposting support, information and self-care opportunities to all our readers. Two sisters had a dream to help people in need of emotional support connect with counselling professionals who could help them. We initially ran the directory for free, but to make it a sustainable business we started charging £10 per month for listings. Within 2 months of charging, we had signed up 100 paying members..
Less than three years after launching, we signed up our 1000th paying customer! Hypnotherapy Directory and Life Coach Directory were launched. Since those early days, we now have over 65,000 social media followers across all of our platforms. We underwent our biggest rebrand yet, with a completely new logo and website to reflect the changing needs of our users. An infographic created for Depression Awareness Week goes viral, reaching over 80,000 on Facebook alone. All these brands came together to create happiful magazine. Healthy ideas that change the world. We reached a total of 20,000 professional members across all of our directories - a huge landmark in our company’s history. Happiful is dedicated to sharing the stories, experiences and support available for the whole of our society and we will work continually to ensure we represent the broadest audience possible. We believe in equal rights for people of all genders, identifications, race, religions, sexuality, ability, shape, size and age – and everyone’s right to be heard and supported. We work with professionals from across our platforms and in different disciplines and practises to ensure our information and advice is reviewed and updated in line with current thinking and practise. We continually welcome feedback.